Garages are one of the most used spaces in our homes. However, on the flip side, they are also one of the most cluttered areas. The National Association of Professional Organizers (NAPO) estimates that up to 50 percent of homeowners name their garage as the most unorganized space of their house. Furthermore, the Wall Street Journal surveyed homeowners, and 74 percent responded that parking in their garage is the essential function of their garage. But, less than half of homeowners can park their cars in the garage. Do not despair! 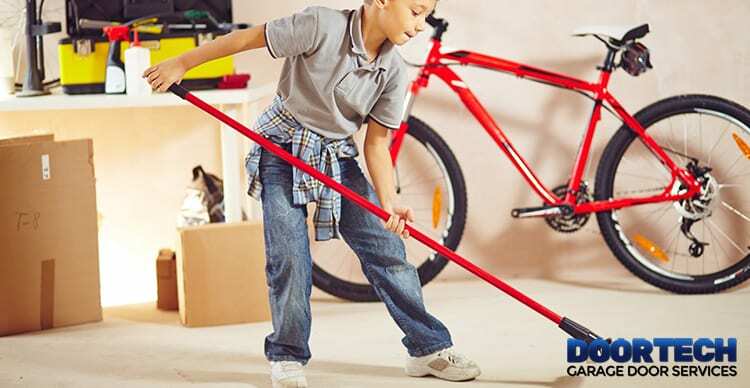 We’ve got some excellent spring cleaning tips that will have you organized. In as short as a weekend, follow our guide for garage spring cleaning. With a little elbow grease, you can declutter and make the best use of your garage! It can seem overwhelming standing in the middle of a cluster of piles of junk and disorganized valuable. Start with a step by step plan. Only focus on one task at a time. Have a clear goal. Perhaps spend one day completely clearing out old, broken or unused items. Then the next cleaning and organizing. Create a checklist and assign family members with specific tasks. Step 2. Make it Fun! Play fun music, or your favorite podcast, or an audiobook. Pace yourself. Take breaks. If you have enlisted help, incentivize and reward them with pizza or another favorite meal or treat at the end of the day. Keep it simple and make four piles: Recycle, Garbage, Donate, Keep. Anything that has been sitting around for more than two years waiting to be fixed or that is broken consider discarding. Perhaps donate items your kids have outgrown, or that you have not used in a while. As you decide what to keep, place those things into organized sub piles: holiday decorations, important files, electronics, yard tools, DIY products, etc. Be honest and ask yourself why you are keeping certain items and if they are truly necessary/useful. Open the window and doors in your garage. Sweep the floor, dust the surfaces like shelves and cabinets, wash the windows and sills. Use a broom to sweep away cobwebs. Next, hose out and wash the floor. Make sure to use a biodegrable, phosphate-free cleanser that won’t harm your grass or plants or waterways. If it is in the budget, consider purchasing organization tools such as bike hooks/racks, shelving, and cabinets. Not only will these items reduce clutter, but they will also keep everything in their proper place and allow easy access. Furthermore, these storage systems also help to protect your belongings from the elements. This is an excellent time for garage door system maintenance. Check all moving parts. Dust and grease where appropriate. Examine your springs and tracks and rollers for any signs of wear or damage. Locate your sensors and clean them and realign if necessary. Look over your garage door opener and apply lubricant to the chain and drive screw openers. Not comfortable with this process? Hire Door Tech to handle it! Our professional team of service technicians will ensure your garage door is in perfect working order. Trust us, a little maintenance goes a long way. It improves your system’s operation and increases its overall life. This season, follow these garage spring cleaning tips!